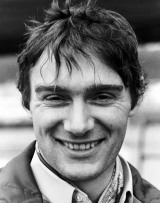 Dave Morgan started racing Minis before graduating to Formula Three in 1970. That season ended in controversy when he was suspended for 12 months for dangerous driving after a collision with James Hunt at Crystal Palace. He was allowed to take part in Formula Atlantic in 1971, and in 1972 his private Brabham won a Formula Two race at Mallory Park but otherwise it was a lean time. He returned to Formula Atlantic in 1974 and with the assistance of sponsors he secured his only Formula One Championship start in 1975. Driving a Surtees at Silverstone in appalling conditions, he was one of a number of cars that crashed in rain near the end. He retired soon after but returned in 1980-81 racing a Colt Lancer in the RAC Tricentrol series. He was subsequently an engineer in Formula 3000 and F1 before heading to Mexico to work in the thriving junior single-seater series. From there he joined the CART series with Payton-Coyne Racing.